Dr. L. Holton Siegling, Jr. I was blessed to be brought up in a Christian home where faith was not simply a matter of attending church on Sunday morning, but was also a vital part of everyday life. Knowing from an early age that I would serve God in whatever vocational capacity I found myself, I received a more specific sense of call while celebrating the Lord’s Supper at a Montreat Youth Conference as a sophomore in high school. It was at that moment when I felt the Spirit of God move within me to affirm that some area of Christian ministry would be my calling. In the years that followed, I continued to be actively involved in the local and greater church in numerous ways. One week after graduation from college, Martha Ann and I were married. The following week we moved to New Jersey where I began my studies at Princeton Theological Seminary (PTS). I put my high energy to good use by serving as the Athletic Director, coordinating the intramural sports program. I fulfilled two internships: one at the Flemington Presbyterian Church and the other at the Presbyterian Church at Westfield. I also fulfilled my Clinical Pastoral Education at Thomas Jefferson University Hospital, located in Philadelphia. 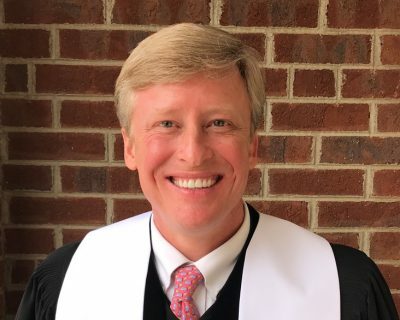 Upon graduation from PTS, I was called to serve as the Associate Pastor for Youth and Their Families at First Presbyterian Church in Spartanburg, South Carolina. In the years that followed, I was called to several other pastorates, namely: Marion Presbyterian Church (Marion, South Carolina), First Presbyterian Church (Fernandina Beach, Florida), and, most recently, Sequoyah Hills Presbyterian Church (Knoxville, Tennessee). I am grateful and increasingly humbled to have discerned with the members of the Pastor Nominating Committee of First (Scots) Presbyterian Church this new call to serve. Given my shared history with and abiding love for the people of Charleston, my familiarity with the ecclesiology of the Lowcountry, and the sense of love for First (Scots) as well as the clarity of purpose which was so evident on the part of the PNC, it was not surprising to find that a sense of joy filled my heart to overflowing as together we perceived that to unite in ministry would not only be a mutual blessing, but that it would also be a most faithful response to God’s work in our midst. My life as a pastor has been rich and full. In 2007 I earned the Doctor of Ministry Degree from Columbia Theological Seminary in Decatur, Georgia. My continuing education has come in a variety of forms, including Presbytery sponsored events, Stephen Ministry training, conferences offered through Princeton Seminary, Youth Specialties and the Festival of Homiletics, as well as three Pulpit Exchanges with sister churches in Scotland. Over the years, I have also enjoyed leading continuing education events, though most of the time I prefer the role of student. My most recent service to the greater church has been with the Committee on Ministry, though I have also enjoyed my past work as a member of the Committee for Preparation for Ministry and as an Ordination Exam reader. My involvement in the community has included serving on such local boards as Habitat for Humanity and the Barnabas Center. Enjoying my work as a Rotarian, I am a Past President and Paul Harris Fellow. Martha Ann and I have three children: Harrison, Will, and Mary Caroline. It was my distinct pleasure to preside at the Baptism of all three of our children. In my spare time I can be found spending time with my family. I am an avid runner and participate in some rather crazy “off-brand” types of races from time to time. I am hydro and solar powered and am happiest when I am both on the water and in the sun! Some of my great pastoral joys include recognizing and celebrating the blessings of God, walking alongside people in their Christian journey, studying God’s Word while preaching it with gusto, and maximizing people’s gifts for Christ’s service.